Introduction: Gena Philibert-Ortega is a genealogist and author of the book “From the Family Kitchen.” In this guest blog post, Gena takes a close look at obituaries and funeral notices and shows how the other names mentioned—survivors of the deceased, pall bearers, those sending flowers, etc., provide important clues that can steer your family history research in new, and sometimes unexpected, directions. What information are you looking for when you search newspapers for an obituary? That’s a hard question: you might be looking for an obituary to reveal a death date, or the name of the cemetery where the deceased is buried. Maybe you are just trying to find out more about the person’s life, or perhaps you are hoping for some confirmation of something you already suspect. While all parts of an obituary are genealogy gold, the names found in an obituary—especially the list of those that survived the recently departed—can yield valuable clues for your genealogy research. A survivors list in an obituary or death notice is helpful because it verifies who was still alive at the time the obituary was published. If you are trying to determine the identity of two similarly-named individuals, or need to learn who was still alive at the time of your ancestor’s death, an obituary’s survivors list can be invaluable. The following obituary for Mrs. F. J. Frost (notice her first name is not revealed, a good reminder that women may be simply listed as a “Mrs.”) provides a wonderful listing of her children and grandchildren, and their residences. These are fantastic family history clues for your further genealogy research. Remember that obituaries for an individual may be published in newspapers from states other than where the deceased resided, so make your initial search a wide one. In this case, for example, the deceased is from California but her son is a resident of Brownsville, Texas, where the obituary was printed. Interestingly, the last paragraph is all about the son and not the mother, even though it’s her obituary. In some cases the other name/s included in a death notice or obituary may be that of a family member but not an actual survivor. In the following example reporting the death of Herbert T. Tait, it identifies him as the husband of the late Arabella—although her name appears in his obituary, she is clearly not a survivor. Sure the list of survivors (typically a spouse, children, grandchildren, parents and siblings) can be found in most obituaries—but don’t forget to scan for the names of pall bearers or those sending flowers, especially in notices printed after the funeral. These names might be family members but may be more difficult to pick out due to unfamiliar surnames. 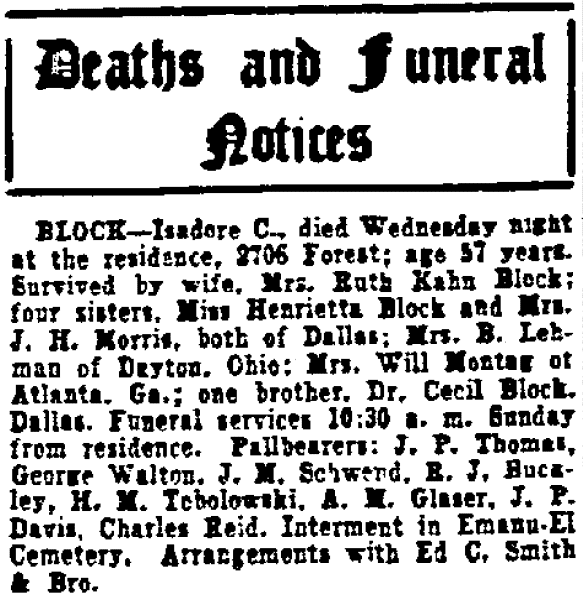 In this death notice for Mr. Isadore C. Block we find names for his wife, sisters and brother. Pall bearers are also listed—and while none of their surnames match the listed family members, it would be important to research each one because they might represent a cousin, nephew, or in-law. Verifying relationships can be challenging in cases where all the women are listed by married surnames or entirely by their husband’s name. One of the difficulties in tracing female ancestors is finding those who married several times when you are unaware of each husband’s surname. 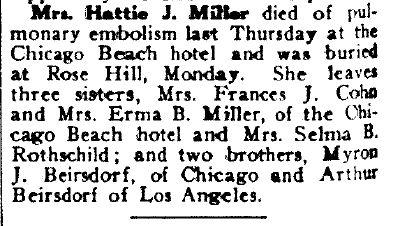 In this very brief notice we learn of Mrs. Hattie J. Miller’s death and her survivors, including her sisters Mrs. Frances J. Cohn, Mrs. Erma B. Miller, and Mrs. Selma B. Rothschild. No spouse or children are listed for Mrs. Miller. Luckily her brothers are also listed, providing us with a possible maiden name for Hattie and her sisters: Beirsdorf. As you look for names in an obituary don’t forget to note any mentions of membership organizations. Those groups might include very good friends that could have honored the deceased in their own way through a special meeting, donation to the family, or some kind of memorial in their records. 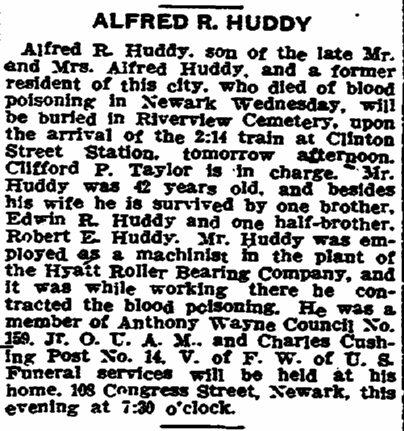 In this notice of the death of Alfred R. Huddy, he is listed as being a member of the O.U.A.M. and the V. of F. W. of the U.S., possibly meaning the Order of United American Mechanics and the Veterans of Foreign Wars, respectively. With this information, additional ancestor research should be conducted in the newspapers (look for article about the person and their group’s activities) and in archival collections for membership lists, records, and images. There’s probably nothing more frustrating than seeing vague references in obituaries to survivors like “he leaves 5 children and 10 grandchildren…” Or this obituary for William E. Rivers, which tells more about his medical history than the names of those he left behind. His obituary and a subsequent notice don’t provide his wife’s name, although she survived him. Further research into his family tree would include a search for Mrs. William E. Rivers, Mrs. W. E. Rivers, and other variations of his name prior to and after his death in 1917. In addition to newspaper research, a genealogist could check the census and city directories for this family. Genealogy Tip: It can be tempting to focus solely on information about the deceased in an obituary, death or funeral notice. However, take time to analyze everything about that article including all of the names mentioned. Those other people’s names can uncover important familial relationship connections that will assist you in your family history searches, and ultimately help you get to know your ancestor better. Great tips, Gena. Another could be not to restrict a search too closely, and to get refreshed on folks’ past history before searching. A branch of my relatives moved to two burned counties in the South, and were much clarified by marriage announcements and obituaries in papers in the Ohio area they came from. Thanks so much for the tips. You are so right. Sometimes we do restrict our newspaper search too much. An obituary can appear in multiple places including where the deceased lived as well as where other members of the family lived. Thanks for taking the time to read the article and commenting. Great article. Thankyou. However I was just wondering if maybe you could give me some tips to find old obituaries of mass burials-like people that died in German Concentration Camps? Or what about people that died in Wars in other countries or perhaps were presumed dead somewhere but no body was ever found? Like maybe someone like Emilia Earhart. Also-for those of us on fixed incomes, barely scraping by-I wonder if you know of any free websites to access old, old obituaries or old old newspapers to freely look at and read online. Please tell me if you do. I’m the only one in my so called family that cares about the past and I badly want to know. Thanking you in advance for any ideas, advice or suggestions you might could give me. Sorry for my spelling errors. Anyway-take care and keep up your great work. To answer your question about free resources, make sure to always consult FamilySearch and Cyndi’s List . FamilySearch includes free access to digitized and indexed records. Cyndi’s List includes links to all kinds of records and websites for all aspects of genealogy. Regarding your question about obituaries for those in mass burials or who simply disappeared and are presumed dead, the answer is it depends. It depends on the situation, place, and time. For your Amelia Earhart example, numerous articles can be found in newspapers across the United States because she was a celebrity. In your example about Holocaust victims, where no obituary will be available you can search other resources like Yad Vashem -The Central Database of Holocaust Victim’s Names or the resources at JewishGen .